Do you have everything set for your big day? Let's run through the checklist: dress - check, location rented – check, officiant – check, invitations all mailed out – check, DJ - check...sounds good so far. But, what are you doing to make your special day that much more unique than the rest? You could go with bolder colors, writing your own vows, even choosing the most "out there" décor you could find, but have you thought about wedding sparklers? Wait, Did We Just Say Wedding Sparklers? Yes, that is exactly what you heard: wedding sparklers. They make a fantastic addition to every aspect of your wedding day. But let's start out right at the beginning of your life together. Picture this: you and your spouse have just completed your vows, you turn to face your guests as the officiant says, "Let me introduce you to Mr. and Mrs. Jones." As you turn, each of your guests lights their heart-shaped sparklers and holds them aloft to guide you down the aisle and out of the church. 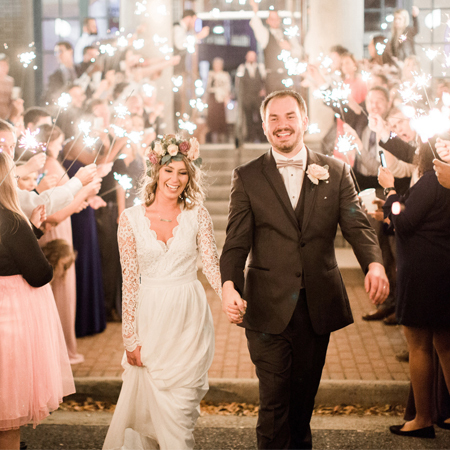 The walkway from the church to your "getaway" car is also lined with guests holding aloft our 36-inch wedding sparklers, forming a processional archway leading you to your vehicle. The sky is aglow with showers of golden sparks that are totally harmless and will not damage your wedding gown. Our wedding sparklers are perfectly safe for all ages (children must be supervised) and virtually smokeless, making them safe for indoor and outdoor use. So, we've only covered the first part of your magical day. There is still the reception to think about. You might be surprised at the many different ways you can use wedding sparklers and heart-shaped sparklers to create a wedding reception your guests are sure to remember for many years to come. But, how do you use sparklers at your reception? Start by using them along with our wedding sparkler tags to mark each of your guests' seats at the dinner tables. Your guests can light them as part of the numerous toasts to help add a little more sparkle to them. Then, of course, there is that magical first dance as husband and wife. This may be the most important dance of your life. Your guests can make it even better by circling you while you dance, each holding a 36-inch sparkler. These burn for approximately 3.5 minutes, plenty of time for the dance to come to an end and for everyone else to join in the dance. Our wedding sparklers make the perfect highlight to your wedding photographs. Take some with just the two of you holding heart-shaped sparklers. Then, to add that final amazing touch to your wedding photos, have your guests illuminate you by holding a variety of different sparklers from the Wedding Sparkler Outlet during the shoot. Wedding sparklers are the perfect way to add an extra sparkle to this most important day of your life.